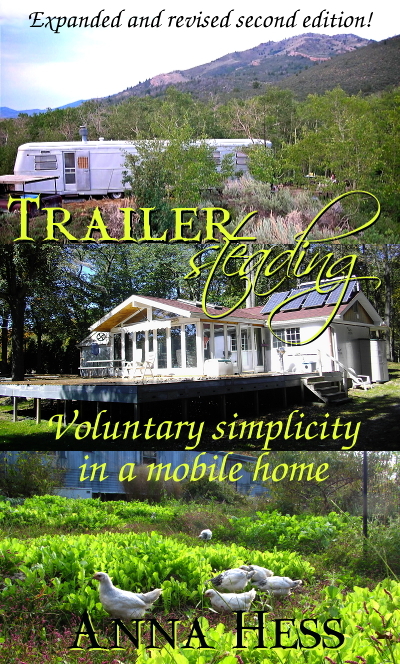 Second edition of Trailersteading live --- and free! Thanks to the cold weather keeping me indoors last week, the expanded and updated second edition of Trailersteading is now live on Amazon. I know that the right thing to do from a marketing perspective is to withhold this second edition until the paperback comes out this fall...but instead I'm doing exactly the opposite. For one day only, I've set Trailersteading free on Amazon so that all of my loyal fans can download a copy! For those of you who already have a copy, stay tuned --- hopefully Amazon will be contacting you soon to give you a chance to download an updated version to your kindle. And, if you're not familiar with Amazon ebooks, it's easy to read them even if you don't own a kindle. My favorite way is to simply read in Amazon's cloud reader, which means you see the ebook in your web browser. But Amazon has lots of apps available too so you can read on your computer, phone, or other device. See this page for more details. Finally, unlike the recent sales that were only active in the U.S. (sorry! ), this freebie should be available world-wide. But you probably can't use the link I provided --- instead, go to your country's Amazon store and type "Trailersteading" into the search box to get your free copy. Thanks for reading, and if you like what you see, please consider leaving me a review. Your kind words are what help strangers decide to take a chance on my books and they earn my undying gratitude. Becky --- Don't despair --- you'll get the update from Amazon. Unfortunately, you may have to wait up to 4 weeks, according to the email I got from them. I apologize for making you wait! Hi, Anna. Was referred to your page and book. I hope you'll consider creating an EPUB version of your book so more people can read it. Kindle is quite limited and you would have a wider audience for more ereaders, plus libraries, if you published in EPUB. Interesting article, that has a familiar vibe of "why not reclaim mobile homes as valuable and useful, rather than shameful".